Sennheiser e906 Supercardioid Dynamic Mic with Three Switchable Presence Settings perfect for drums and guitar amps. Need a versatile mic to handle drums, percussion, amplifiers and other instrumental sources? Sennheiser has the answer with the e 906, a supercardioid dynamic mic that's custom designed for great instrument reproduction! 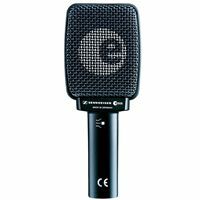 The e 906 instrument microphone is especially tailored for guitar amps, and is also excellent for percussion and horns. The e 906 is custom-made for demanding instrumental use. It has a very fast transient response, which makes it ideal for guitar leads and percussive sounds. In addition, the e 906's frequency response of 40Hz-18kHz can handle instruments from toms and congas to triangles and cuicas. The e 906 features a switchable presence filter which allows you to tailor the sound characteristics to different sound requirements and styles. The filter is adjusted via a slide switch on the microphone. The slide switch is tamper-resistant - to change positions, just use a pointed tool such as a small screwdriver. The switch has three positions: one boosts the presence range (with a mid frequency of 4.2kHz) for aggressive metal rhythm guitars. The Normal position is great for classic rock. And the third position attenuates the presence range, with a mid frequency of 4kHz, for warm and smooth jazz and blues sounds. You can hang the e 906 on a guitar amp for stand-free performance. Its laterally mounted capsule has been specially developed for miking guitar amps face on and extremely close to the signal source. Due to its flat design, the 906 is also very suitable for use with drums, since it can easily be positioned in cramped space conditions (e.g. below the cymbals). The supercardioid pattern is great for reducing bleed in tight situations onstage, and the 906's hum compensating coil rejects interference. Stick the e 906 in front of your amp or drum kit and you're ready to go!